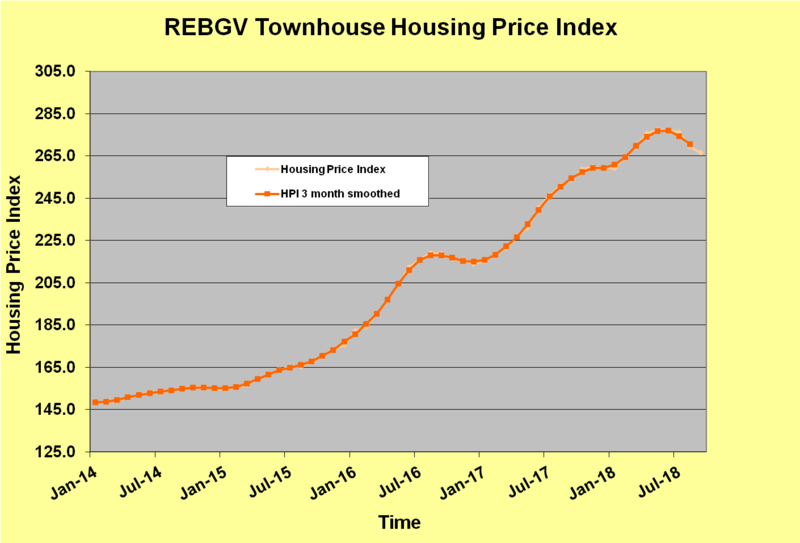 The real estate market for the Real Estate Board of Greater Vancouver (REBGV) and surrounding areas remains historically slow in terms of aggregate sales. Here is a link to my complete set of charts and graphs. Here is a link to the REBGV media release in which the author states: Last month’s sales were 36.1 per cent below the 10-year September sales average. Let’s take a quick look at current price trends. 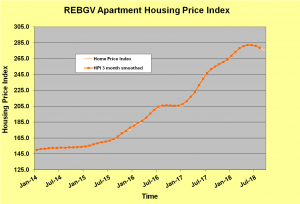 Remember these are measured by the House Price Index (HPI) which tracks the typical or 50th percentile properties. 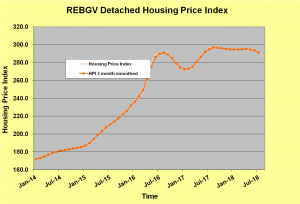 Detached: Following a drop and bounce back of around 7 – 8% following implementation of the PTT Foreign Buyers tax in July 2016 prices were fairly level through the last half of 2017 and first half of 2018. 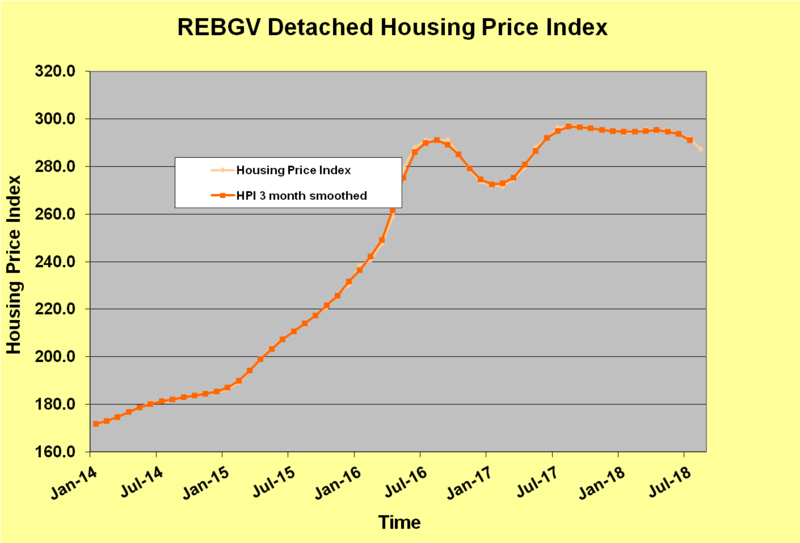 In the last 3 months detached HPI for the REBGV has seen a decrease of around 2.7%. 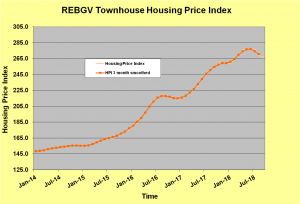 Townhouses: As the graph below shows this sector was much less affected by the imposition of the new tax in July 2016 (demand is more domestic?) and in fact continued to increase almost 30% from the end of 2016 to mid 2018. 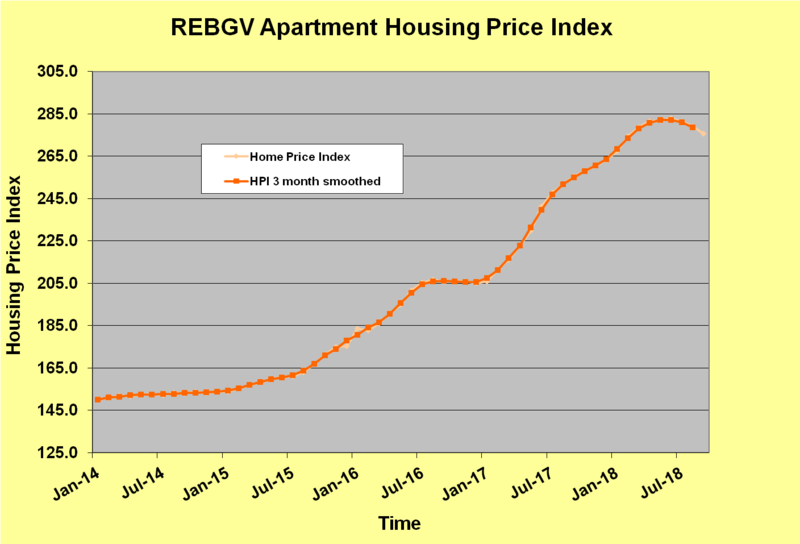 In the past months the HPI has decreased around 4%. The common theme across all three property types is that price levels for typical propertied have decreased in the order of 2.5 – 4% over the last 3 months. I continue to advise my clients to focus on those properties that are selling as opposed to those that are not. Also consider both short and longer term outlooks for the real estate market both locally and on a wider scope. These policies are clearly currently being effective as evidenced by the reduced sales levels. What does that mean for each individual owner – whether personal, corporate, trust etc? What are the reasonable future expectations both short and long term? Most importantly what will be the effect on price levels and thus on both affordability and equity positions? I make myself available to advise clients on a case by case basis as individual situations may widely vary.